Are Your Brakes Screaming For Help?--Call Millennium Transmission & Auto Care! Your brakes are a very important safety feature of your vehicle. Regular inspections and maintenance are necessary to ensure your safety as well as others. At Millennium Transmission & Auto Care we recognize the significance of timely brake repair and maintenance. Since 1998 Millennium has been proudly family owned and operated. We work hard for our customers and have a reputation for giving dependable, fair, and affordable brake service and repair. Our team is highly trained and ASE certified. We are constantly learning and updating our team’s skills and knowledge to assist in providing the best service possible. We are always here to answer any questions you may have. Call Millennium Transmission at 330-773-1998 the next time you find yourself in need of brake repair in Akron, OH. We work on all makes and models both foreign and domestic. If you are uncertain your brakes are working properly, please have a brake repair specialists inspect them for you as soon as possible. Our Customers Safety is a top priority to us. Brakes are too essential to be uncertain of their condition. Periodical inspection while you are driving can help you identify problems early and possibly save you money on repairs. Listen to your brakes while driving. Do this with your air and music off so you can hear the audible warning signs. If you hear or feel any of the following signs, you should have your brakes serviced soon, if not immediately. First warning signal to listen out for is a high pitch squealing noise when braking. If caught early you can avoid damaging your rotors. A small metal indicator is located within most brake pads. When the indicator is exposed within the pad, it emits a high-pitched noise. This signifies replacement is necessary soon. The second warning signal when braking; does your car pull to the one side or the other? If so, this can mean a few different things. In regards to your brakes, it can signal uneven tire wear due to brake pads. This is typically due to improper wheel alignment. An additional warning signal is soft or spongy brakes. Your brakes should be firm and react quickly. If there is a leak or air in your brake line, it can cause unresponsive or delayed braking. Lastly, if you feel grinding when braking, it can indicate your pads are completely worn. What you hear and feel is a product of metal on metal contact. This can greatly reduce your ability to slow down or stop safely. Moreover, it is hazardous. 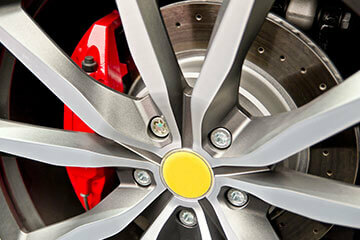 Millennium is committed to offering the best brake repair and maintenance service possible to the Akron community. We are confident in our auto repair services and guarantee them with an industry-leading 2-year/24,000 mile warranty. Same day service and walk-ins are welcome. Call or schedule service online today.